So you may look at the title of this book and think, "What the heck?" Let me explain. I was first introduced to Sophie Hudson through her podcast with another one of my favorite authors, Melanie Shankle. Their podcast is called The Big Boo Cast because their blogs are entitled the Boo Mama and Big Mama blog(s), respectively. Y'all. These ladies are HILARIOUS. I do not say that lightly. I had heard about their podcast through the years, but since I am way behind the times, had not yet given it a listen. Y'all. It does not disappoint. It is literally two ladies just having a conversation. It sounds like their lunch date or late night phone chat. These women cover a lot of territory- from makeup and clothes to Netflix and church. They're wonderful. Give it a listen if you haven't already and you need a laugh. They will deliver. So back to Eunice. 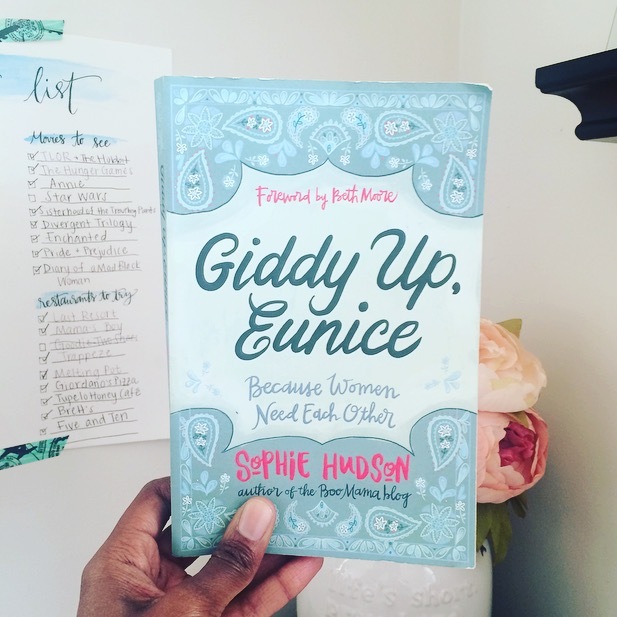 This book, Giddy Up, Eunice, is not Sophie Hudson's first, but it was my first read of hers. I loved it. It made my laugh and cry, and it was oh so relatable. Her tone of writing is fun and lighthearted at times, but she also delivers truth in such a unique way by sharing anecdotes from her own life that allow us to examine our own. Giddy Up, Eunice: (Because Women Need Each Other) takes a look at three different female relationships from the Bible. She first examines Mary and Elizabeth, then Ruth and Naomi, and lastly, Lois and Eunice. Sophie challenges us to look at the relationships within our lives and see whether we are 1) being pointed to Christ by other women, and 2) pointing other women to Christ. It takes a village-not only to raise a child, but just to live, I'm convinced. And Sophie reminds us of the amazing life transformation that occur when women decide to lay down their hang-ups and just love on one another. Personally, my life has been changed for the better by women who decided that pouring into young women was a worthwhile step of obedience. There have been so many women, other mothers, as my mom likes to call them, who have walked alongside me in various seasons. And I want to do the same. Many women will make excuses as to why they can't mentor or be mentored. Too much time. Not enough Biblical knowledge. I'm not good enough. LIES. Y'all. Mentoring does not have to be some fancy event in which you meet with a woman every week for two hours at a time studying the Greek and Hebrew meanings of every word in a passage of Scripture. If you want to do that, great. But what it can look like is going to get coffee once a month. Texts every week or so to check in. Praying for one another. Inviting someone into the mess and doing laundry together or making dinner. It's not that complicated, but we like to make it complicated. So friends, take a look at your life. Are you being mentored by anyone? It doesn't have to be an official agreement, but is there a woman (or man for my three male readers) in your life that you can go to when you need wisdom and advice? Is there a younger girl who you are pouring into that you are praying for? If not, are there people in your life that are right under your nose who can fulfill that role? Pray for open eyes and an open heart, and just watch what God does.